Wally Berg calling in here the evening of November 2, our intended Everest summit day. I think almost all of you know by now that we were all  David, Garry, myself and the Sherpas - were all on the South Summit much earlier today. If I sound a little tired now, it’s because I have been moving for about 18 hours with the typical small amount of food and drink that you do on a climb like this. I’ll explain why I’ve been moving so long soon. But the gist of the story of this climb is that we got up at 10 pm last night. At quarter to twelve we were moving and we had amazing climbing conditions, the triangular face was what we call styrofoam snow  easy and efficient climb. As you know we were on the Balcony quite early. I found some breakable cross-wind slab type conditions moving away from Balcony towards the South Summit. The South Summit itself was not particularly hard. The amazing thing, after a bit of wind, just a mixed moderate wind at the South Col we climbed in perfectly still temperatures until the South Summit. Now think about that, the South Summit is higher than K2. That’s where we all were today. 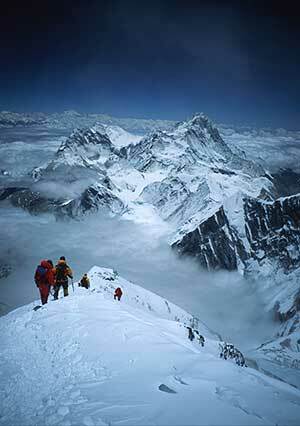 The South Summit of Everest is only about 400 or 500 feet lower than the summit of Everest. Of course to traverse you cross quite an exposed ridge, including the Hillary Step. I was almost shocked, although I probably shouldn’t have been  Michael Fagin told me, “You’d better be careful, those winds might pick up on the 2nd.” They certainly did. So with mixed emotions we turned around. It was definitely the call. The clock was running against me. I had a turn around time of 10 hours, 10 hours from the South Col to the Summit. That’s a 300 foot ascent rate if you want to talk in feet. It took us nine hours to get the entire group to the South Summit. In the conditions we had this morning, we wouldn’t have been out there in one hour. We would have been out there in two hours or more. And that was a factor. But those winds really clinched it for us. Now, believe it or not, I’m sitting at Camp 3. Garry and myself are the last ones descending. And we’ll soon be back down at Camp 2 in Shom’s friendly kitchen. I’m looking up at a sunlit but a very wind-blown Everest summit and I’m listening to those winds again. So only by a matter of a couple of hours it was not our day. I think we’ll always, for the rest of our lives, count ourselves to be privileged to have been on the South Summit on November 2. And if you’re wondering about winds and what else they did, we returned to the South Col to find three of our tents absolutely torn apart and destroyed. It must have been 100 miles an hour winds there today while we were gone with the Sherpas. So we did the logical thing, we drank a little tea from our thermoses and we kept moving. It’ll be nice to be down in Shom’s cook tent tonight. And I’ll give you some more reflections and follow up tomorrow. 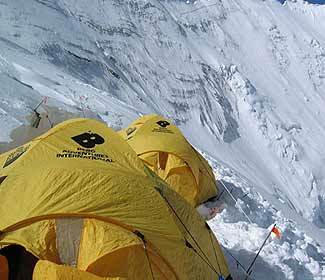 But the entire team will be in Camp 2 tomorrow  not quite off the mountain, not all the way to Base Camp, but a long, long ways from where we were earlier today at the South Summit. It’ll be a day I’ll remember for the rest of my life.